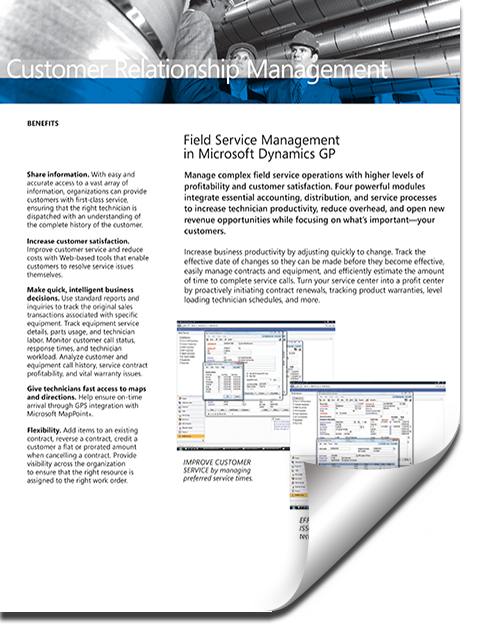 Manage complex field service operations with higher levels of profitability and customer satisfaction. MIG & Co. is one of the premier implementers of Field Service Management software offering both Microsoft Dynamics Great Plains (GP) Field Service and Wennsoft Field Service with tight integration into Great Plains (GP). Either of these systems integrate essential accounting, distribution, and service processes to increase technician productivity, reduce overhead, and open up new revenue opportunities while focusing on what’s important — your customer. Learn how to manage your company’s complex field service operations and achieve increased profitability and customer satisfaction.